Teague spent his youth in The Shed watching Gloucester. After cutting his teeth with the local All Blues club, Teague joined the Cherry and Whites during the 1978-79 season aged 18 making 4 appearances, his debut coming at Kingsholm against Exeter University on 15/11/1978 in which he scored a try in a comfortable victory. He combined his rugby with his career as a fitter for the local water authority before becoming a builder in what was the amateur era, eventually setting up his own building firm with his brother-in-law. Known to Gloucester fans as ‘Iron Mike’ he played the majority of his club rugby for his home town club, but also had brief spells at Cardiff RFC for half a season and Stroud RFC with his close friend and Gloucester back row colleague John Gadd, before re-joining Gloucester on both occasions. During the later years of his senior rugby career he played for Moseley, before re-joining Gloucester once again to see out his playing days. Teague made a total of 301 appearances for Gloucester, winning the John Player Cup in 1982 (although they had to share the title with Moseley after a 12-12 draw in extra time – the only time the cup has ever been shared) and the John Smith’s Merit Table in the 1985-1986 season. He was twice a runner up with Gloucester in National Courage League 1 (now the Premiership) in both the 1988-89 and 1989-90 seasons. He also played in the 1990 Pilkington Cup final defeat to Bath, scoring a try in both the 26-16 quarter final away win over Nottingham and the 17-12 semi final away win over Northampton that secured Gloucesters spot in the Twickenham showpiece. During the 1981-82 season he scored 20 tries, which remains the club’s record for most tries scored by a forward in one season. 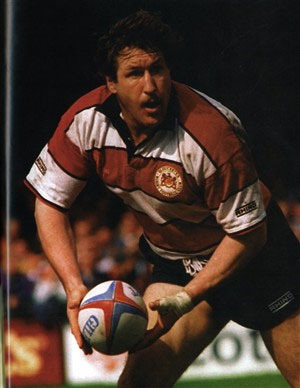 His last game for Gloucester was against Harlequins at Kingsholm at the end of the 1994/95 season aged 34. Teague was also selected to represent Gloucestershire on a number of occasions, starting on the bench against Somerset at Twickenham in the 1984 county championship final, which Gloucestershire won 36-18. Other notable games he was involved in for Gloucestershire include starting on the bench in the 1981-82 county championship semi final defeat to Lancashire at Kingsholm, starting on the bench in the 1982-83 county championship semi final victory over Surrey at the Memorial Ground, Bristol and starting at blind side flanker in the 1984-85 county championship semi final defeat to Nottinghamshire, Lincolnshire and Derbyshire at the Memorial Ground, Bristol. Teague represented England at Under 23 level before playing his first England B game in the 20-10 win over France B in November 1981, winning a place in the England trial the following month. Teague made his test debut on 2 February 1985 aged 24, in the then five nations, as a substitute for Jon Hall in a 9-9 draw against France at Twickenham. He was then selected for England’s final game of the tournament against Wales but the match was called off due to icy conditions and John Hall won his place back for the re-arranged fixture. Teague made his full test début on the summer tour of New Zealand the same year, playing in both test matches. He was not selected again for almost four years, eventually playing in a 12-12 draw with Scotland in the 1989 five nations. In order to bulk up and regain his place in the England team he trained every day with body builders in the local gym, as well as doing ‘Mad Dog’ training with Gloucester. That involved hill running, often at three-quarter pace, carrying logs and rocks. It was intense and he had to find the time for daily training between his work as a builder. He went on to become a key member of England’s Grand Slam team of 1991, scoring the only try in England’s 25-6 win against Wales in Cardiff on 19 January, England’s first win in Cardiff for 28 years, as well as scoring against Ireland in Dublin. In the same year he helped England reach the World Cup final, playing in five of England’s six matches including the final, a narrow 12-6 defeat to Australia at Twickenham. The world cup final was his last appearance for a year; he sat out the 1992 Five Nations suffering from injury and exhaustion. However, he would reappear in England colours, playing against South Africa on their return to Twickenham after the sporting embargo had been lifted. His final England cap was against Ireland at Lansdowne Road in the 5 nations in 1993. England second row Paul Ackford christened Teague ‘Iron Mike’ at the time when Mike Tyson was world heavyweight champion. Teague played 27 times for his country, 19 times as blindside flanker and 8 times at number 8. He scored a total of 3 tries for England against New Zealand in Christchurch on 1 June 1985, Wales in Cardiff on 19 January 1991 and Ireland in Dublin on 2 March 1991. 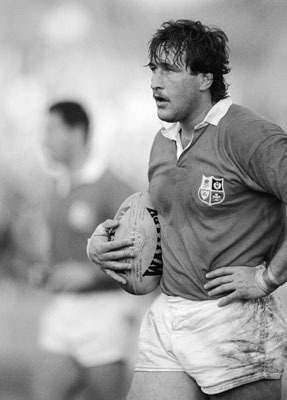 In 1989 Teague toured South Africa with a World XV. He started in the first of two IRB sanctioned tests played against South Africa to celebrate the centenary of the Soth African Rubgy Board (SARB), a 20-19 defeat for the tourists at Newlands on 26 August 1989.